.... Does Will like... HAVE friends? O_o It just ocurred to me... You know, Jack is probably his best friend, all things considered. And being as all things are taken into consideration... isn't that sad? O_o;; Adunno. Anyways... It shall be colored. Eventually. Done with MY best mate, the Faber-Castell PITT artist pen. And some pencils..
AHHHHHH I LOVE IT I REALLY LOVE IT!!!!! Cute version of them *Favs* great work *turns green of envy*. so cute! i love faber castell pens too! woot! 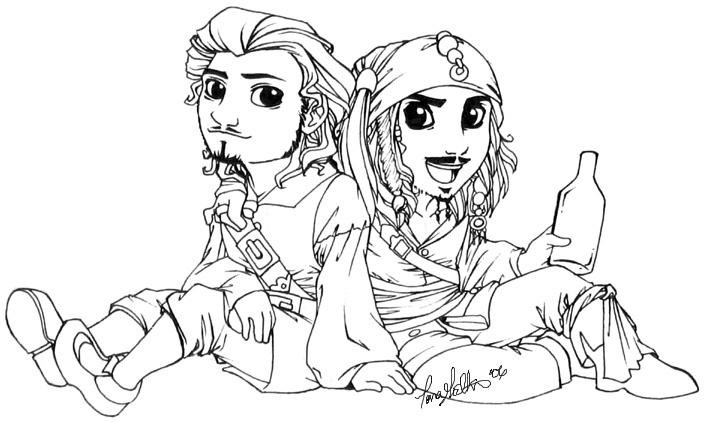 Awesome, but I think it should be jack and rum and have will shaking his head in the background. Awesome pic though! aaaaaaaaaawwww look how cute they are with those big eyes x)nice work! i miss seein yer stuff! i nearly jumped clean off my chair when i saw u uploaded a new one ^_^ yayness! thats cool. their heads look a little big comapred to their bodies, but seriously IT ROCKS! Thanks a bunch, glad you like it ^^ And Chibi heads are supposed to be big.